Post 59 ES-345’s are still cheap. A few years ago, I could have sold this very clean watermelon red 60 for $17K. Today, it’s $13K. It’s got a couple of changed parts but still, $13K? For this? I must be nuts. If you read last year’s year ender, you would have noted that 345’s were really in the dumper. Stereo 355’s were in the same leaky boat. But that was then and this is now. And, somewhat surprisingly, they are pretty much right where they were then only now… it’s now. Still a tough sell and still a smart buy. I get that they aren’t as good an investment as a 335. I get that they aren’t as desirable as a 335. But I also get that they are every bit as good (and often better) than a 335 and they cost about half as much. Leave the stereo VT circuit or pull it out. I don’t care (as long as you put the original harness in the case). I sold a stop tail 64 this month with no issues-just some wear-to a smart buyer in Italy for under $10K. 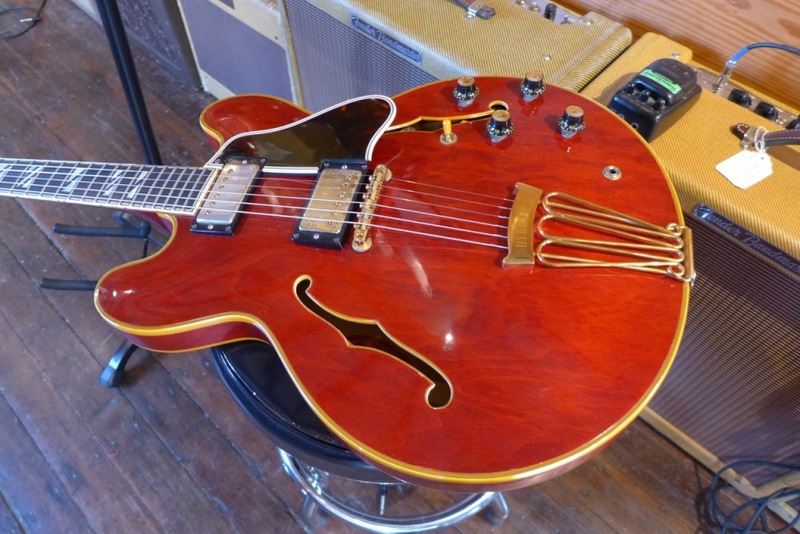 That same guitar, had it been a 335, would have been at least $17K. 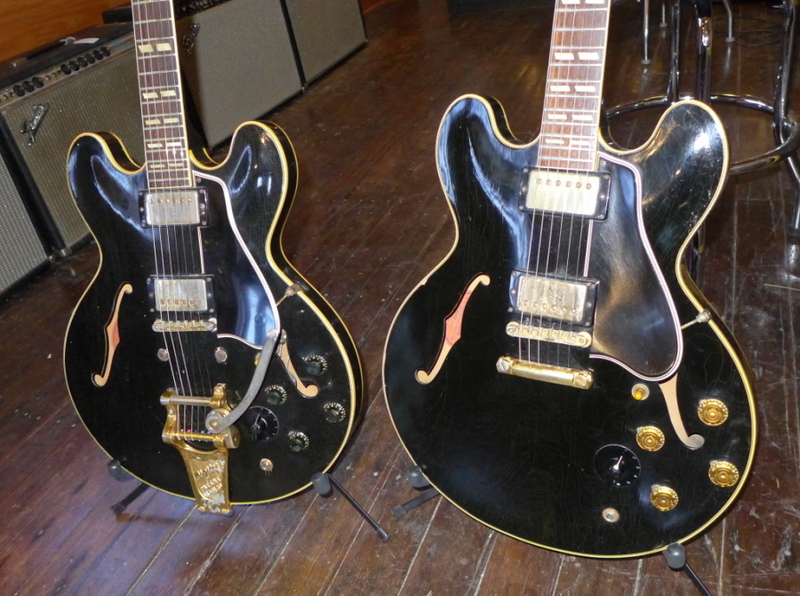 Stereo 355’s are the same story only maybe a little worse since there aren’t more than a handful of stop tails and the Bigsby (or sideways or Maestro) only makes it harder to sell. As these guitars dip below $10K, they become a pretty amazing deal. Most gold hardware guitars made up through 63 have PAFs and some 64’s do as well. At the current market value of over $2000 each for PAFs, these guitars are no brainers. When you consider the cost of a brand new Gibson, these make even more sense. They are a steal. Truthfully, I don’t see much more downside and I’ll likely be buying well priced stop tail 345’s as they come up. Yeah, there are still plenty of buyers who think their 60 is worth $20K or more but they either must not want to sell them or they are delusional (or both). The exception to the above are the 59’s and the mono 355’s. Especially the early ones. An early big neck mono 59 355 or a “first rack” stop tail 59 ES-345 is a hot, hot guitar. I can sell as many as I get. I just can’t get that many. Both have cracked the $20K mark and sell very quickly-often in a day or two. Later 59’s are also strong but not quite at the level of these rarefied fat boys. A transitional neck 59 345 stop tail will be in the mid teens for sure and a really collector clean one might hit the high teens. Knock off 15%-20% for a Bigsby version. Since virtually all 59 355’s are Bigsby’s, the discount is built in. A 59 355 stereo falls somewhere below a stop tail 345 and a Bigsby 345. I still can’t figure out why a late 59 is worth more than an early 60, which is identical in every way, but I don’t make the rules. 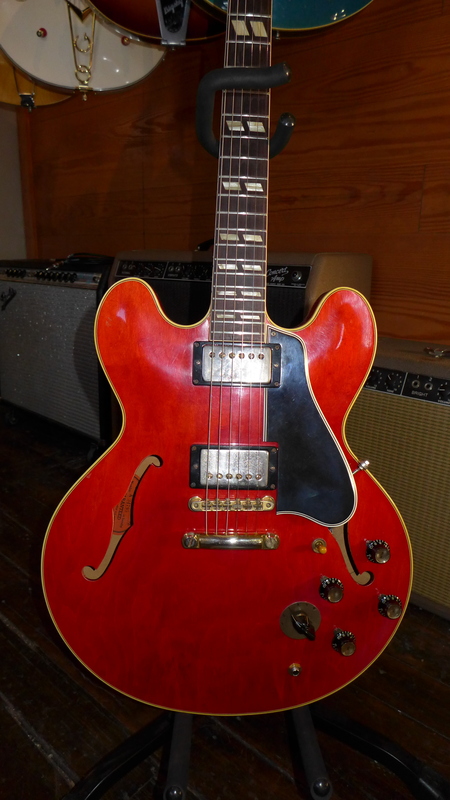 And speaking of early 60’s, what is keeping the prices so low on 60-64 ES-345’s and stereo 355’s? There has been a quiet trend toward slimmer necks. Not everyone can play the real fatties but everyone seems to like to talk them up. I recently switched from playing a huge neck 58 to playing a transitional 60. As my hands get older, my ability to move quickly with all that wood diminishes. So, maybe with so much of my clientele over 50, it’s just the arthritis talking. But it’s talking fairly loud. Even so, the prices remain fairly depressed. I remember selling a Bigsby 60 back in 2010 for $12000. I’d be lucky to get anywhere near that much today and the overall market is well up from then. If, indeed, the slimmer necks are getting more love these days, then the 60-63 market is poised to move upward. And it should. Even the slim neck 345’s and 355’s can be spectacularly good. There is a school of thought that equates fat necks with great tone and while I agree to an extent, it is not a rule. I recently had a 62 that was stunningly good and there is another 62 in my all time top five. So, get out there and find the bargains. They are out there for sure. A 60-64 ES-345 or 355 is calling your name. I think I can hear it now. Or maybe that’s just my ears ringing from diming that tweed Bandmaster I’m so fond of. Of course all bets are off if the 345 in question happens to be factory black. These went for some pretty big bucks in 2016. I hope I find another pair. Dot necks continued to be the leader of the group. They were strong all year with the 1960 models showing considerable growth, especially the early ones with the 59 features. This is a 61. Well, that just about wraps up another calendar year and that means it’s time to look back and assess what happened. Specifically, I want to look at the vintage guitars market. We will leave politics alone. I have some pretty strong opinions but they are largely irrelevant when talking about old guitars. 2016 was, to a great extent, an “up” year. Values for nearly all vintage guitars were up incrementally. Most have kicked up value wise in the single digits-10% or less. A few have dropped a bit (like 50’s and 60’s Strats) and a few have shot up significantly (like blonde 335’s). Even though I’m pretty active in vintage guitars that aren’t 3×5’s, I don’t think I sell enough of them to identify major trends in value based solely on my own experience. While it’s true that I sold around 10 vintage Strats this year and felt a clear and present downward pressure on price, I will leave it at that. No analysis, no insight beyond simple observation. But the 58-64 335 market is my market. There are lots of dealers who are way bigger than I am-by orders of magnitude bigger. I keep, at most, 50 guitars in stock at all times-mostly ES335’s, 345’s and 355’s from 1958 to 1964. There’s an occasional mid or late 60’s example and maybe an 81-84 here and there but you can count those on two hands. There are dealers with many hundreds of vintage guitars and a few with over a thousand. But, I don’t think you’ll find another who bought and sold nearly as many early vintage ES models as I did this past year: More than 70 on the buy side and 65 on the sell side. That puts me in a position to identify and quantify the trends in this very narrow market. 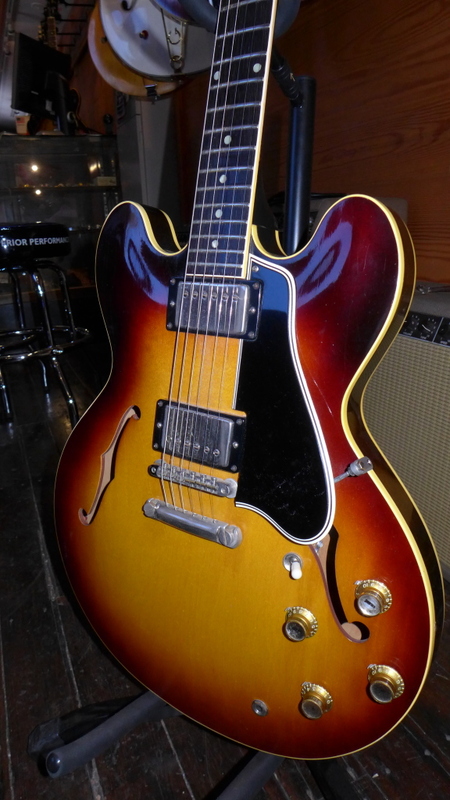 Most striking is the scarcity of really good original early 335’s. Collectors and players have been enthusiastically buying up the good ones for more than twenty years and there is a very finite number of them and it isn’t a big number. When you take away the ones that have been broken, refinished or heavily modified, the numbers are all the more striking. There were only around 600 335’s built in 1959. Given the number of guitar players out there, that’s not a big number. How many are left in the “wild”? Judging by my experience this year, not very many. The majority of the 59’s I saw this year came from collectors or players thinning their herds. That’s fine-it keeps the market moving but to find an uncirculated one owner 59 has become a once or twice a year experience. My experience this year with 58’s was largely the same. As you move into the 60’s, the numbers go up and by 64, Gibson had made more than 1200 335’s which is probably why I see so many more of them. So, which 335’s did what in 2016? The big story this year is the incredible scarcity of blonde 335’s. I saw only 3 this year. A very nice bound 58, a near mint 60 (which I still have) and a Bigsby 59. I know of a sale of a 59 at $90K at the high end and a sale of a 60 Bigsby (by me) with a few issues at $40K. My stop tail 58 sold at $82K. That’s up nearly 20% over last year. Asking prices have reached $100,000 (and that’s a 60). Early dot necks (58-early 60) were very strong this year but too many dealers are being overly “ambitious” in their pricing and the guitars are sitting for months (or years). This hurts the market because the individual sellers think their guitars are worth the asking price they see on Reverb.com or Ebay or Gbase. 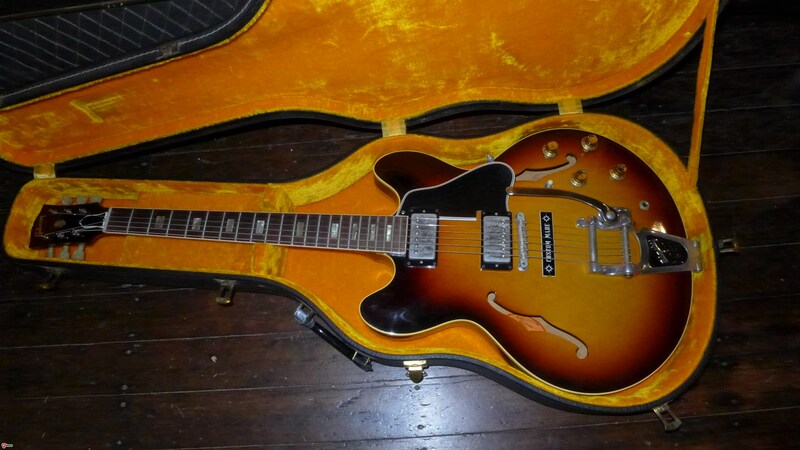 So, I get offered average sunburst 59 335’s at $40,000 or even more, which, of course, they aren’t worth. I don’t know what others get for their guitars, but I know what I get. Top dollar for a sunburst 59 is around $45K. And that’s for a no excuses, hundred percent original guitar in near mint condition. Later 60 and 61 dot necks are, of course, less popular due to the thinner neck but that seems to be changing. The trend toward huge necks seems to be reversing. I think folks talked up the big necks and made them a big deal but practicality has overtaken the “mine’s bigger than yours” attitude that has prevailed for years. I’m seeing more players asking for slimmer necks and that recent trend is driving up not only those those years but 62’s and 63’s as well. 2015 was pretty flat for 60-63 but 2016 has seen a pretty good bump both in stop tails and Bigsbys. Stop tail 60 dot necks are well into the $30K plus range and 61’s are approaching $25K or more. As always, a mint example is going to command a premium. Early blocks from 62-63 (small necks) were up as well. The real world price hasn’t cracked $20K despite what so many sellers are asking. I sold around 15 62 and 63’s this year and never once cracked $20K. Finally the venerable 64, still the easiest 335 to sell, has bumped up in value in 2016. The red stop tails are the leader but sunburst stops are just as valuable-they just don’t sell as fast. Even though the vast majority don’t have PAFs, they still command prices equal and sometimes greater than the 62-63s with them. Bigsby’s in top condition have passed $15K and are heading up and top condition stop tails are likely to push past $20K any day now. Next we’ll look at 345’s and 355’s. Not your run of the mill 355. This is a late 1960 special order. Call them customs, call them one offs, call them special orders, call them late for dinner-it makes no difference to me-I just love them. Whether it’s somebody’s name inlaid into the fretboard (whom you’ve never heard of), a custom order color, short scales, tenors, weird cutaways-it doesn’t matter. They are still the coolest guitars out there. They represent, to me, a more accurate and detailed snapshot of the era. Instead of buying what Gibson was selling, the folks who ordered these specials wanted what they wanted and were willing to pay extra and wait a long time (usually months) to get them . We see more custom orders at the higher end of the market-ES-5’s, L-5’s, Super 400’s and the like probably because these were the guitars played buy the pro players with a steady (and sometimes considerable) income. Considerable egos too, sometimes. 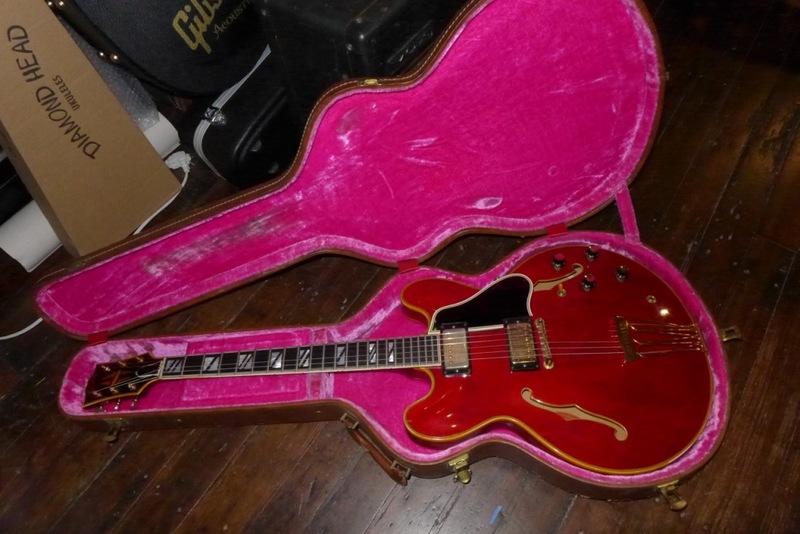 This custom is a 1960 ES-355 that was just offered to me (and I bought it) and it’s a beauty. So what’s special here. Well, lots. There are no less than 4 custom elements here. See if you can spot them before I spill the beans. Look at the close ups at the bottom of the post for better detail. Well, it’s a 355, so there ought to be a Bigsby. Stop tails are crazy rare but how about a trapeze? And it says Byrdland on it. I don’t know if that’s the one Gibson put on the guitar but there are no extra holes so if there was a different one the day it was built, the holes lined up perfectly. No telltale “snakebite” Bigsby holes in the top. This baby came with a trapeze for sure. And what about those Super 400 inlays. The big pearl block inlays on a 355 are pretty nice but these really pop. Beautiful. Let’s see, what else is there…look at those f-holes. Not only are they bound but they are bound with multi ply binding. My Super 400 didn’t even have that. 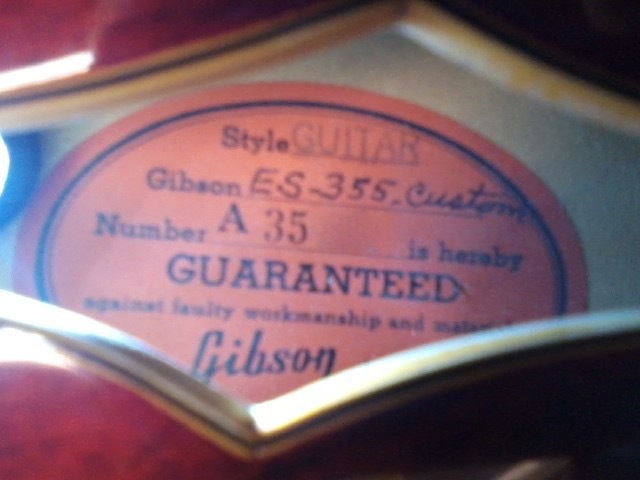 I’m not sure I’ve ever seen that on a Gibson-correct me if you have. And then there’s the fingerboard binding-multiply again-this time like a Super 400. So, it’s kind of a 355 mono with S400 elements but not quite. The original buyer must have been very specific about what he wanted and probably paid a huge premium for it. What is great about this one-beyond the unusual and wonderful custom elements is that it’s very clear that these weren’t aftermarket mods. It’s not too hard to put bindings on the f-holes or change out a fingerboard with different inlays and binding. I’ve got a guy in my area who can do that with one hand tied behind his back. But the trapeze? Can’t fake that. The holes are always the giveaway. No stop tail holes, no Bigsby holes, no sign of anything but that big ol’ trapeze. The other cool thing is that the label says “Custom” written in ink right next to the 355. My inside guy at Gibson took a peek at the shipping log page for me and confirmed that it says “custom” next to the entry but no details. So, do these one offs have a different value than the standard issue 355? That’s a tough question because some do and some don’t. I don’t mind an owner’s name in the fingerboard, although most collectors find it off putting and the price reflects that. I kind of like it, in fact. You sometimes see a 58-60 335 that should have dot markers with a 345 fingerboard. That one is actually worth a bit less, in my opinion because you buy a dot neck for what…the dot neck. Now, if you bought a 355 for the block markers, then S400 markers would be a negative but you buy a 355 because it’s a bit of a pimpmobile and the fancier, the better is kind of the whole idea. While not quite the pimpmobile that a Gretsch White Falcon is, the 355 is still pretty tarted up. So, to take the most appealing element of a 355 Mono-(the fancy stuff-otherwise, you’d just buy a 335) and make it even more appealing is, well, pretty appealing. And the old rule–“don’t fall in love” still applies. Like I always say, I’d own 200 of these if I didn’t abide by the rule. OK, this is too obvious. Must be a custom – it says so right on the label.